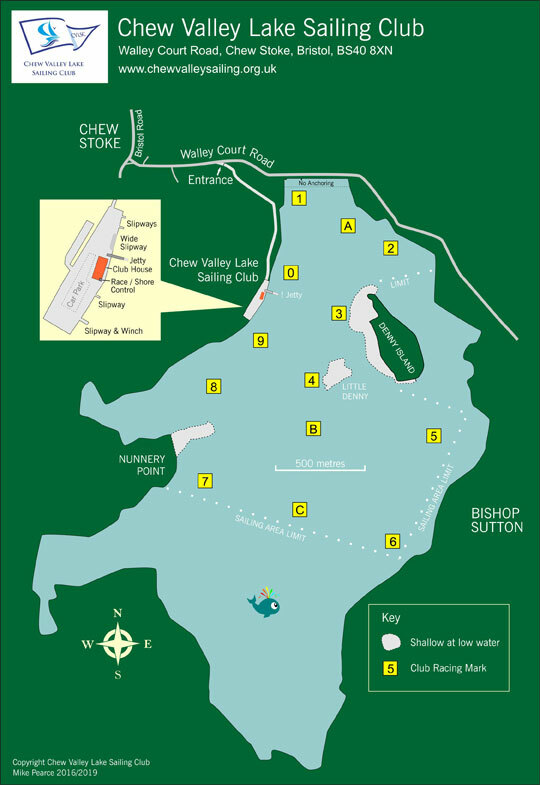 Chew has a large sailing area, approximately 3 km long. It is divided into two areas, the restricted area and the full area. The full area can be used throughout the winter and on Sunday afternoons, although in recent years this restriction has not been applied, enabling the use of the whole sailable area all year round. The sailing area is marked out by lines of small white buoys. The race marks show yellow flags with black numbers for the numbered marks and white flags with black numbers for the lettered marks. The numbered marks start at zero at the north end of the dinghy park and go around the periphery of the lake in a clockwise direction. Down the centre of the lake from north to south are three extra marks – A, B & C. An additional mark ‘X’ can be used anywhere on the lake at the discretion of the race officer. For open meetings the club uses large orange inflatable marks. Club races may be started from the race hut at the south end of the terrace or from a committee boat anchored on the lake. There is a sailing gate off the southern end of the clubhouse building, the transit of which is marked by two red and white poles in front of the race hut. The inner and outer distance marks have blue flags. The map can be down loaded. Try laminating it and take it sailing with a chinagraph or marker pen!